They say politics make strange bedfellows, but they can also get you kicked out of bed. It remains to be seen if Fox News producer and Bill O’Reilly ambush interviewer extraordinaire Jesse Watters will need to make new sleeping arrangements after Politico reported, over the weekend, that Watters donated $500 to President Obama‘s reelection effort in late September. 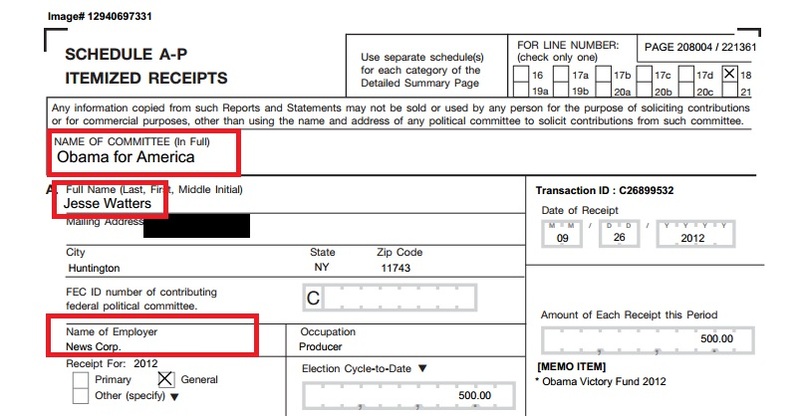 The Federal Elections Commission requires candidates to report donations above $200, and according to FEC disclosure records, Watters donated $500 to the Obama Victory Fund, which splits the donations between the DNC and Obama For America, on Sept. 26, 2012. The report lists Watters’ residence in Long Island, New York, and his employer as News Corp., and his donation amount of $500. The donation, received on Sept. 26, came at a time when President Obama really had Mitt Romney on the ropes, just before the first presidential debate essentially evened up the race. The revelation is a joyful one for critics of Fox News, as Watters’ antics are the reddest of red meat, making him reviled among liberals. However, there’s every chance that this is some kind of publicity stunt. The FEC donor search shows no previous donations by Watters, to any candidate or committee, and coming, as it did, when all seemed lost for Romney, Watters may have been sowing the seeds for some future bit. His subsequent declaration that Obama voters are “zombies” who would support the President “as long as there was Obamacare, gay marriage and abortion on demand” fit a little too neatly into the hypocrisy narrative. Is it possible that Watters decided, for the first time in his life, to donate an amount that would require disclosure, at a time when his ostensible candidate least seemed to need it? Sure, it’s possible, and it’s also possible that Watters is the lowest-paid Fox News producer in the firmament, and could only afford to donate the equivalent of The O’Reilly Factor‘s daily budget for green room snacks. It’s just a little bit suspicious. There’s also the intriguing possibility that the entire conservative media and political establishment is just a front to get Barack Obama reelected by making his opponents seem horrible. Think about it for a minute. Newt Gingrich? Reince Priebus? Mitt Romney? Fraggle Rock came up with more convincing names than these. Political donations have gotten other media figures into hot water in the past, but Fox News is a uniquely insular organization. There’s every chance that even if Watters does pay some price for this, we’ll never know it. Or we can look forward to an upcoming Factor segment in which Watters ambushes himself.